Looking for self storage? Well, you've found the right place! We offer convenient, safe, drive-up storage in Albion, a suburb located in western Melbourne. We offer the most competitive prices in Victoria! Need storage? Click here to book your container now! Why are we able to offer so much for so little? 1. We offer a no-frills, down-to-earth, simple storage facility. We don't hire out trailers, sell boxes or any of the other materials you might need to move - you can get all of these here. We won’t win any awards for looking the best and we don’t offer any add-on services. We cover the basics because that’s all you need for secure, strong, safe self storage! 2. We have low overheads and if you want to meet us on-site, we will need to make a time to do it. In order to maintain our prices, we don't sit around all day waiting for the phone to ring! You can call us anytime you like, but we don’t think you should be paying for our time if we are not there! If you do need to meet us, we can easily arrange this, but most of the information you need to know is on this website. 3. We only offer 2 sizes of storage - either a 20' shipping container or a 40' shipping container. This makes it easy for us to manage and we do not cater for people wanting to store only a very small number of items. Despite this many people find that a bigger storage space with us is still cheaper than less space at another facility. 4. The minimum time for storage is 3 months. We can’t offer these prices for less than that because of the time and effort it takes us to set up a new customer, but we make it worthwhile for you to store for longer! That’s a win for us and a win for you! 6. Finally, we are not for everyone and we don't try to be. All the information about our business is on this site. You can find out anything you need to know here and then decide if Sunshine Self Storage is right for you! SIDENOTE - Download our FREE report before you store anything! At Sunshine Self Storage, we pride ourselves on giving honest service at a very fair price. To help you make an informed decision about your storage, we have provided a FREE report that you should read before you do anything else with your valuables! This will provide more information to help you make a choice about the type of storage that you need. The ability to back right up to your container and get easy access to goods. Storage facilities where you have drive in access to your storage area are more common now than they used to be, however the majority of storage facilities still require you to transport your items from your car, truck or ute to the storage unit on a trolley or similar. Wouldn’t it be nice to just back up to your unit and store everything! Our industry costing surveys regularly indicate a price difference of up to 57% between different facilities offering similar sized storage units! Don’t get sucked in to paying more for fancy marketing or services you don’t need. Make sure you can get what you need at a price you can afford. We hope you enjoy our website and find all the information you need here. If you would like to make a booking, please go to our storage booking form reserve your place now. Please click here to receive a list of our competitive prices where you can have instant access to the most up-to-date prices. Good luck in your search for self storage. your container and you have access whenever you want. 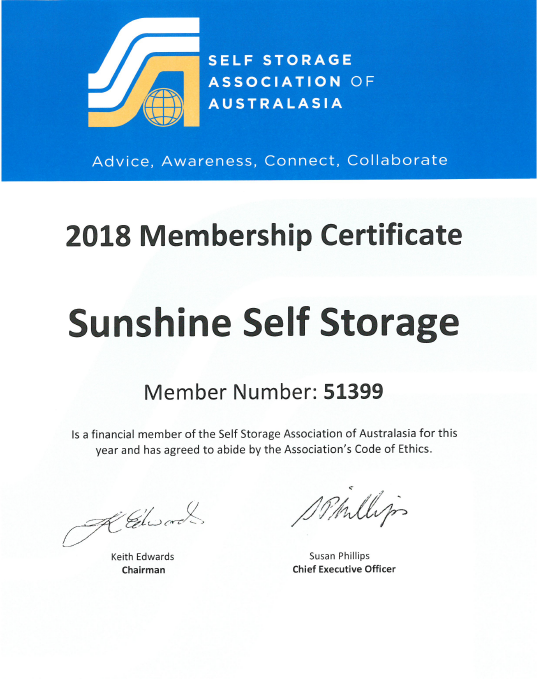 Sunshine Self Storage is a full member of the Self Storage Association of Australasia (SSAA) and have been since 2004! Our Membership Number is 51399 and our current membership certificate is show below. You can see all our membership certificates since 2004 here. The SSAA is the Industry Association for Self Storage in Australia and New Zealand. You should never book self storage with any company that is not a member of this group. The SSAA provides legal protection for storers and self storage owners and ensures that every transaction is fair and equitable. Copyright (C) Sunshine Self Storage Pty Ltd. All rights reserved.